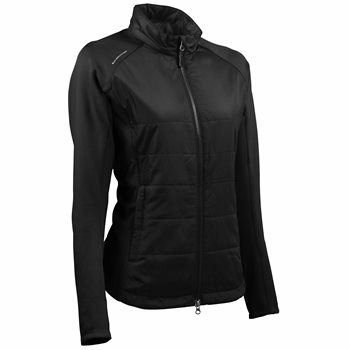 The Sun Mountain Hybrid wind jacket has been upgraded to include lighter weight, 4-way stretch fabric. The jacket features quilted, windproof body panels to keep you warm and stretch panels in the sides and arms that provide freedom of movement. The Hybrid wind jacket is designed with an athletic cut; a two-way, Vislon zipper; a stand-up, zip-through collar with chin guard and zippered hand warmer pockets.